I just tried out Azure Naturals Vitamin C serum and I love it! I’ve been using it for about a week and it has really helped to make my skin more youthful, vibrant, softer, and tighter. After receiving the product I read the instructions. They state to wash and pat dry the face, apply toner if you use it first, then a thin layer of Superb Essence vitamin C 20% serum and allow to dry. Then apply moisturizer and sunscreen. I have been following this routine and I have really noticed a big difference. My skin is softer and feels more protected. I like the way the product feels on the skin it is not sticky and dries quickly. I noticed that my skin looks more vibrant and younger which I love. I have even noticed that it feels more firm and less wrinkled. I am loving this product! VITAMIN C WORKS – Our vitamin c product line dramatically boosts the production of collagen, which increases your skin’s rate of cellular renewal. Improved cellular turnover refines your skin’s texture, while visibly plumping and firming your skin. With consistent use this will start to minimize fine lines and wrinkles. Our serum is also perfect for sun damaged skin. We have combined three of the most powerful anti-oxidants available into one serum! Vitamin C, Ferulic Acid, and Vitamin E when combined can provide up to eight-fold antioxidant protection, a 96% reduction of sunburn cells, and prevent the formation of new free radicals in sun exposed skin. This will fade age spots and dramatically improve discoloration leaving your skin with a youthful glow! This wonderful line of vitamin c products is specially formulated to work together to improve the effectiveness of one another. For that reason, we would like you to use them all, together! 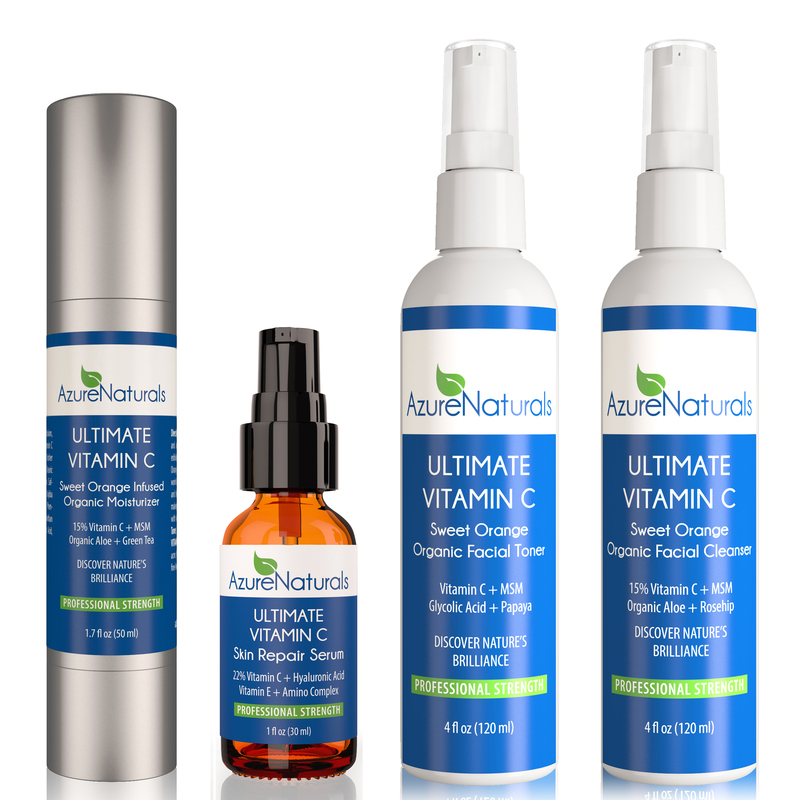 AZURE NATURALS – ABOUT US: Azure Naturals provides high quality facial skincare and anti-aging products using natural and organic ingredients whenever possible. We are committed to delivering the finest skin care system and making sure that our clients are 100% satisfied with the results. Our customers are looking for better health and better skin and the solutions that we develop will always be designed around these elements. We appreciate those who are taking the journey with us to return to your youth. WHY AZURE NATURALS? Azure Naturals is committed to offering you superior, natural and organic ingredients in every product we offer! Compare our ingredients to similar products. Not only will you find we have superior organic and natural ingredients, but our products are considerably less expensive per bottle! More expensive does not mean it works any better! If you don’t care about wasting money, you should still buy our product because it works better! You can always donate the $100 you save to charity! You can purchase from Amazon!